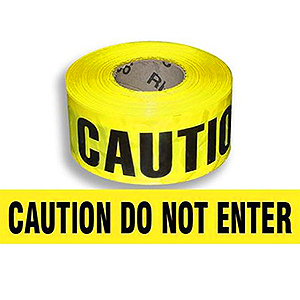 Bright YELLOW Tape Repeats CAUTION DO NOT ENTER continuously in black bold letters. Meets OSHA 1910.144 specifications for marking physical hazards. APPLICATIONS: Recognized worldwide as the tape used to identify dangers. Used by many industries including the following industries: Law Enforcement, Construction, Painting, Safety, Event Management, Mining, Custodial, Hardware, and Utility. Warn of hazards and prevent accidents. Highly visible heavy duty red tape. Can be tied, stapled, or nailed in place.